Here are the ten most popular news articles, week ending 13th November 2016, covering catastrophe bonds, ILS, reinsurance capital and related risk transfer topics. To ensure you never miss a thing subscribe to the weekly Artemis email newsletter updates. The numerous challenges and hurdles facing global insurers and reinsurers suggests the market needs to evolve at a faster rate than it has historically, and the future of the industry lies somewhere between the traditional and alternative model, according to John Charman. According to a filing on the Tel Aviv Stock Exchange, the insurance claim for the destruction of an Amos 6 satellite, owned by Israel based company Space Communications, will total $196 million, perhaps lower than some of the initial loss estimates. The insurance-linked securities (ILS) market is expected to increasingly look to leverage a rated balance-sheet in the future, and in fact the ILS wave over recent years may only have served to highlight the benefits a rated balance-sheet can offer, according to company CEO’s at an event in Bermuda today. Florida headquartered primary insurance company Universal Insurance Holdings has added an additional layer of protection against catastrophe losses, in the form of a risk-linked contract which appears to be parametric in nature. 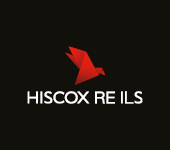 Reinsurance Group of America (RGA) has entered into a €1.3 billion longevity swap and reinsurance agreement with AXA France, a deal that covers over 15,000 annuitants. Alternative reinsurance capital, in the form of collateralised products such as catastrophe bonds, industry loss warranties, sidecars and collateralised reinsurance contracts, is growing faster than traditional reinsurer capital and has made an “indelible footprint” in the market, says Standard & Poor’s. In October 2016, the U.S. Money Market Fund (MMF) industry changed dramatically with new requirements for U.S. institutional prime and institutional municipal MMFs becoming effective. In our opinion however, thanks to a carve-out for U.S. government and Treasury funds, the insurance-linked securities (ILS) markets needn’t lose sleep over these changes. Reinsurance companies are accessing a greater volume of alternative capital through actively managed vehicles, while the collateralized reinsurance, industry loss warranty (ILW) and quote share reinsurance sub-sectors highlight ongoing ILS market growth, according to Aon Benfield. John Whiley, who was previously Head of ILS Administration at Prime Management Limited a division of SS&C GlobeOp, has joined reinsurance linked asset manager Markel CATCo as its new Chief Compliance Officer. 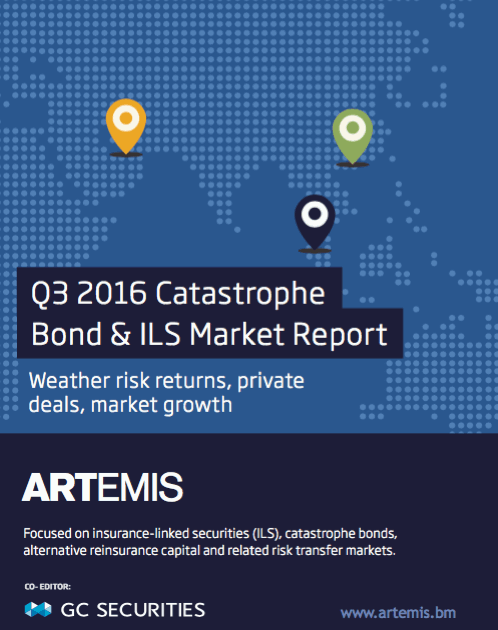 We’ve now published our Q3 2016 catastrophe bond & ILS market report. This report reviews the catastrophe bond and insurance-linked securities (ILS) market at the end of the third-quarter of 2016, looking at the new risk capital issued and the composition of transactions completed during Q2 2016. Q3 saw $1.087 billion of risk capital issued from eight transactions, making it the third most active Q3 of the last decade in terms of deal volume, and one of the busiest in the market’s history in terms of number of deals. Strong investor appetite for cat bond and ILS investment saw the outstanding market size increase from the $25.174 billion recorded at the end of Q2, to $25.449 billion.